The accidents of two prototypes built during 1952-1953 were a regrettable surprise for all. In due course, testing of the first production machine was completed, and the terms of transfer of planes to airlines were thoroughly checked. In 1956 there was an accident with another machine during crew training, and therefore the first operational flights of the Britannia commenced only at the beginning of 1957. Overall 86 machines of this type were built, the main operator of most of which was B.O.A.C. Another major operator was African Safari Airways, created in 1967. Primarily it carried out charter air transport from the main European airports, such as London, Munich, Frankfurt, Milan, Madrid, Paris and Vienna. The capitals of major African countries such as Egypt and Kenya were the airports of destination. 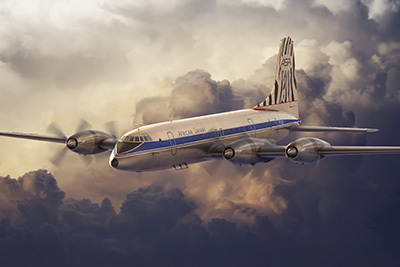 From the very beginning the Bristol Britannia and the Douglas DC-8 were the airline's principal aircraft. However, operation of the Britannia continued for only a limited length of time, until 1972, when the airline's fleet was finally converted to jet planes exclusively. Bristol Britannia, 5Y-ALT, African Safari Airways, UK, 1970.